Some of today’s most in-demand studio mavens released some of their early tracks on mau5trap including Chris Lake, Feed Me, Michael Woods, Excision and Noisia. At Rebel, fans will get to experience the sound of mau5trap today. In addition to a set from the evening’s headliner, the man himself, deadmau5, REZZ will preview material from her upcoming mau5trap EP while BlackGummy makes a stop at Rebel as part of his Monolith tour with new music from a rumoured upcoming EP. L.A.-based producer/composer/DJ Matt Lange will deliver a darkly melodic breed of electronic music rooted in raw energy and emotion including material from his recent EP Escapist, ATTLAS will share some of his most recent tracks including his latest single “What You Do To Me” and Monstergetdown¸ the newest member of the mau5trap gang, adds a breath of west coast-flavored techno for the night. 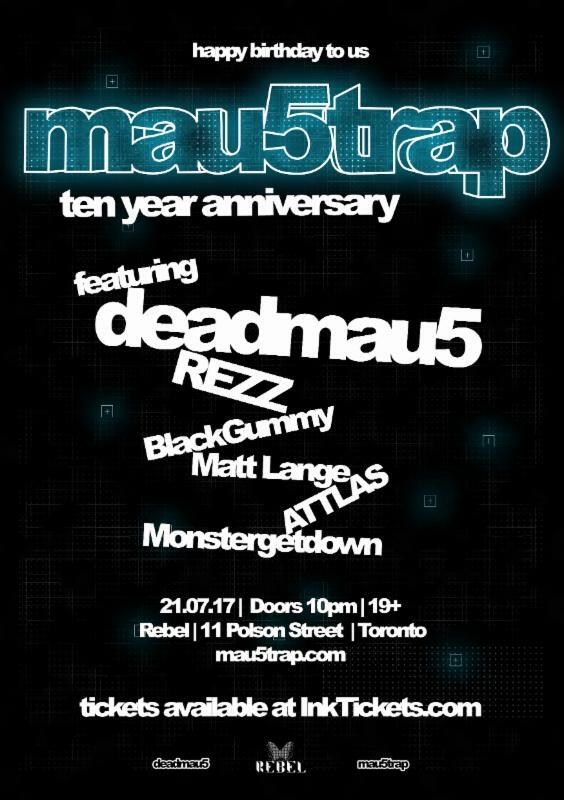 The Rebel night is just a part of what deadmau5 and the mau5trap crew are planning as part of the 10-year festivities. Stay tuned for more info coming soon.